Pittsburgh Dad and Attorney Edgar Snyder Meet on Live Episode of "No Fee TV"
February 27, 2013, Pittsburgh, PA – On March 5th at 7:30pm, Pittsburgh Dad and Attorney Edgar Snyder will meet for the first time on a live episode of No Fee TV, a weekly program that airs on PCNC-TV. 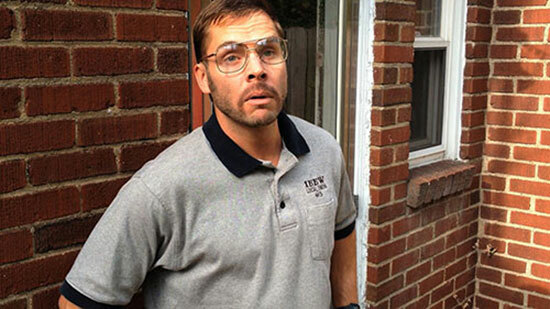 Curt Wootton is the face behind Pittsburgh Dad, the YouTube series that generated more than 3 million views in 6 months. He will join Attorney Snyder to discuss life in Pittsburgh and the impact of social media. This year marks the 30th year of advertising for Edgar Snyder & Associates, the Pittsburgh-based law firm that helps accident victims throughout western Pennsylvania. For those who grew up in the region, seeing Attorney Snyder's face on television commercials was a common childhood experience. The Pittsburgh Dad video series captures these types of nostalgic memories shared by those who call Pittsburgh home. In some respects, Attorney Snyder could be called "Pittsburgh Grandpa." "I often meet people who recognize me from the commercials they watched growing up," said Attorney Snyder. "People are always asking me to take photos with them doing the ‘point.'" Wootton, who plays Pittsburgh Dad's character, has referenced Edgar Snyder & Associates in previous episodes and looks forward to introducing "Dad" to Edgar on the upcoming show. "There's a lot of fun and humor in introducing dad to a longtime Pittsburgh personality like Edgar," remarked Wootton. Host Shelley Duffy will interview Pittsburgh Dad with Attorney Snyder on the live show. Viewers will be invited to call in questions for "Dad" and Attorney Snyder. Questions may also be submitted in advance using the hashtag "#NoFeeTV" on Twitter and Google Plus, or by posting on the firm's Facebook page. The episode will air live in Pittsburgh on the Pittsburgh Cable News Channel (PCNC) on Tuesday, March 5th at 7:30pm and re-airs on Saturday, March 9th at 12:30pm on PCNC. Those who live outside the Pittsburgh region can watch the video after the show airs on the Edgar Snyder & Associates YouTube channel. No Fee TV is an interactive, live, half-hour show that provides a free legal consultation and answers to viewers' questions on legal topics related to Personal Injury, Workers Compensation, and Social Security Disability. Radio personality Shelley Duffy hosts the weekly discussion with the partners of Edgar Snyder & Associates who address a different topic each week. The show airs live every Tuesday evening from 7:30-8pm on PCNC, owned by WPXI Studios. It re-airs on Saturdays at 12:30pm on PCNC. Pittsburgh Dad is a YouTube series that depicts life from the perspective of a stereotypical "blue-collar" father living in Pittsburgh, PA. Created by Chris Preksta and Curt Wootton, the viral series generated more than 3 million views in only 6 months. The videos have been broadcast at Heinz Field before Steelers games and featured across various media outlets.